Traditional Chinese Medicine (TCM) in general terms, is formed by the practice of acupuncture, herbs, and Tui Na (Chinese massage). When it comes to neck pain, there are a few herbs that can be used, both topically and internally (e.g. notopterygium root), but it is the acupuncture and Tui Na that are most effective in treating this type of pain. Pain in the neck area is a very common type of pain, as you tend to hold a lot of your stress here, especially where your neck meets your shoulders. In our society, stress is a common contributor to neck pain, as is posture, which tends to be forgotten as we rush from place to place and sit at a desk for a large portion of our workdays. The symptoms of neck pain usually involve stiffness, along with varying degrees of pain, which might spread into your shoulder, upper back, or arms. Along with the neck pain you may also experience headaches, a lack of ability to properly move your neck, and even some numbness, tingling, or weakness in one or both of your arms. Long-term (chronic) neck pain can also lead to fatigue, depression, or anxiety. In scientific terms, neck pain is usually caused by stress and/or poor posture, and can also be caused by poor sleeping position or injury (especially in sports). Less commonly, this type of pain is caused by infection, cervical spinal stenosis, or rheumatoid arthritis. In TCM terms however, neck pain is diagnosed in terms of a completely different paradigm. In Chinese medicine, a fundamental belief is that everything that exists in the universe can also exist within us. Thus, we can be affected by Wind, Cold, Heat, Dampness, and more (note: these terms are capitalized to differentiate from the scientific definitions). 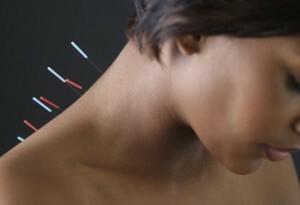 In TCM, your neck can be affected in the short term (i.e. acutely) by Wind-Cold invasion, or by a simple sprain. The symptoms are the same, i.e. neck pain with sudden onset, stiffness and a limitation of movement. Sometimes a preexisting condition of Liver deficiency or excess can encourage this type of neck pain (your Liver is sensitive to Wind). Chronic neck pain can come about because of repeated acute attacks that are not treated properly, and there is almost always an underlying Liver pattern present. Thus, acute flare-ups of chronic neck pain are almost always caused by Wind invasion. Plus, if you have a tendency towards Qi (energy) stagnation, Dampness accumulation, or another condition that may encourage blockage, this will also need to be addressed. Since much of the information related to TCM is fairly esoteric in nature, and since acupuncture is usually very successful at treating this type of pain, it is best to have your acupuncture performed by someone who is trained as a TCM practitioner. Other types of professions practicing acupuncture will likely not be very well versed in TCM diagnosis, and so their acupuncture will be limited in scope. In addition, if herbal consultation is called for, it is certainly only a TCM practitioner who should be sought out. If Tui Na is performed to treat your neck pain, your practitioner will likely focus on treating your neck in a fashion that is dictated by their knowledge of meridians (pathways of energy and nutrient-flow throughout your body). This means that your TCM practitioner, if massage is part of their treatment, will work on a certain meridian looking for sore points. For example, your Gall Bladder meridian runs along the side of your head, down your neck, through your shoulders, and down the side of your body. This meridian is often a great focus for massage in terms of neck pain, as you may have more than one point that is tender, or experiences some kind of discomfort. One of the great advantages of seeking treatment with TCM is that it treats your whole body, and not one part at a time. Thus, if you're suffering from something else, e.g. depression or fatigue, your TCM treatment can have a profound effect on that symptom as well as your neck pain.